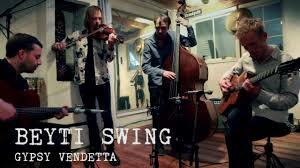 Gypsy Vendetta is fireworks of gypsy swing executed with lightning speed. With a mixed repertoire covering standards by Django Reinhardt and Duke Ellington as well as the orchestra’s own compositions, which contain elements from the both the Balkans and Arabic music traditions. They may remind you of Django Reinhardt a summer night in Paris or a sweaty gangster jazz club during the Prohibition. Or maybe they just remind you that acoustic instruments can still burn the dance floor in the year 2018.